At Maloney Elkassem Chiropractic we have been providing rapid and effective relief for our valued patients since 1997. You'll see that we utilize a variety of state-of-the-art healing methods to give you individualized care that is right for you. ART is one of the most effective forms of treatment for repetitive-motions injuries. With a success rate of over 90%, Active Release Technique has become one of the most sought after treatments in the world. Spinal Adjustment, also known as Spinal Manipulative Therapy (SMT), is a type of health care treatment that focuses on restoring normal joint function in the spinal joints. Graston Technique is an innovative, patented form of instrument-assisted soft tissue mobilization that enables clinicians to effectively break down scar tissue and fascial restrictions. Kinesiology tape is a product which once applied to a part of the body aids in pain relief, inflammation reduction, and structural support. Professional athletes all over the world are using Kinesio Tape. Whiplash can be the result of any trauma though it is most commonly associated with motor vehicle collisions. Even minor whiplash injuries may lead to a variety of symptoms which have the potential to become chronic, especially when not cared for appropriately. Common work-related injuries that we treat include: neck and back injuries (whiplash, sprains and strains), shoulder injuries (tendonitis, rotator cuff injuries), elbow and wrist injuries (golfer’s elbow, carpal tunnel syndrome), and hip and knee injuries (IT band, bursitis). Our amazing staff has extensive experience with athletes from every sport and all levels of competition. Whether an injury is the result of overuse, poor biomechanics or trauma – a thorough assessment and customized treatment plan is essential to a quick recovery. Chronic back pain is often the result of a vicious cycle that starts with irritated of injured tissue. This leads to inflammation and muscle spasms. The numbness or tingling associated with Carpal Tunnel often occurs when one of the nerves to the hand is compromised in some way. This slows or even stops the nerve signals to and from the hand. Elbow pain, in its most common form, is often referred to as either "tennis elbow" or "golfer's elbow". These types of elbow pain are usually a result of tendonitis, bursitis, or irritated nerves. Carpal Tunnel Syndrome is the most common initial diagnosis for numb or tingling hands. There are many other factors contributing to hand numbness including poor work ergonomics. The majority of headaches stem from mechanical dysfunction of the upper neck and can be eased or eliminated with appropriate treatment. Heartburn is often described as a burning feeling in the lower chest, that may be accompanied by 'gassiness' or belching and a sour or bitter taste in the throat and mouth. Hip pain, while often assumed to be the result of arthritis, is often due to injury or irritation to the soft tissue surrounding the hip. Hip pain is most commonly 'hip bursitis' or "IT Band tendonitis'. Jaw pain (or 'TMJ' pain as it is often called) is often the end result of trauma to the neck and head (as with whiplash or concussion injury). Knee pain, while often thought to be the result of arthritis, is often simply due to injury or irritation to the soft tissue surrounding the knee. Knee pain is more commonly the result of tendonitis or bursitis. 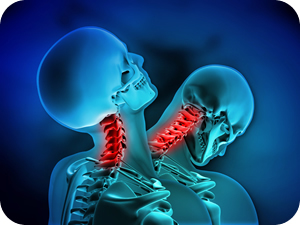 Neck pain can be the result of either trauma (such as whiplash) or chronic, repetitive strain. There are several different factors that can contribute to neck pain such as inflammation, soft tissue adhesion, or muscle weakness. Foot and heel pain, which is often diagnosed as Plantar Fasciitis or Achilles tendonitis is a very common affliction. Rotator Cuff Syndrome is one of the most common forms of shoulder pain. The rotator cuff is a group of four important muscles that both support the shoulder and rotate the arm both clockwise and counterclockwise. Injury can result from either trauma or chronic, repetitive strain. Sciatica, or sciatic nerve pain refers to pain or numbness that starts in the back or the buttock region and shoots down the leg towards the foot. Sciatica usually occurs when the main nerve down the back of the leg is irritated or compressed. Shoulder pain comes in many different forms, including rotator cuff tendonitis, impingement syndrome and adhesive capsulitis-commonly known as frozen shoulder. Any of these problems can be a result of trauma or chronic, repetitive strain. Balance information comes from our eyes, inner ears, and balance receptors in our joints and small postural muscles. When any (or all) of these three systems is upset in any way the result may be a sensation of spinning, or vertigo. Whiplash is a common term for a collection of symptoms that may include neck pain/stiffness and loss of neck mobility. Other symptoms can be headaches, double vision, jaw pain, ringing in the ears or numbness into the face or upper extremity. The vast majority of wrist pain is usually the result of tendonitis, tenosynovitis, or carpal ligament capsulitis. Any of these can be a result of trauma or chronic, repetitive strain (using a computer).